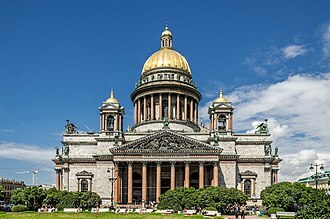 The present day version of the church was designed by the architect Christian Frederik Hansen (1756–1845) in the neoclassical style and was completed in 1829. A school was established early on. 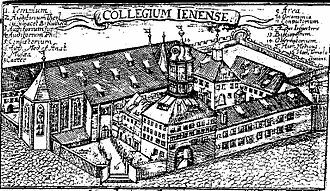 In 1479, parts of the church school received a charter and become the University of Copenhagen. Professors were brought from Cologne, Germany. The international faculty widened Denmark's exposure to the great ideas and philosophies of the day. The university challenged the growth of the Protestant movement, but was eventually closed. By 1537 it reopened as a centre for Lutheran studies. The Protestant Reformation was hard on St. Mary's. 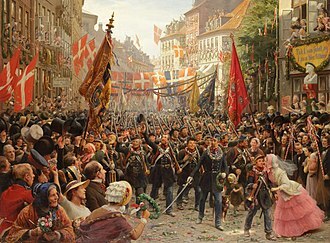 Citizens of Copenhagen had elected to follow Luther, but Roman Catholic officials at St Mary's tried to maintain the church as a centre of Catholic resistance to change in Copenhagen. 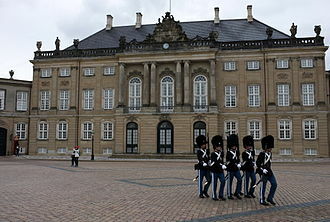 By royal decree both Roman Catholic and Lutheran priests were commanded to use the church jointly, which incensed the majority of Copenhagen's population. 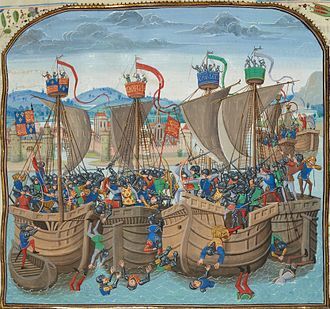 On 27 December 1530 hundreds of citizens stormed St. Mary's, destroying every statue and dismantling the choir stalls. 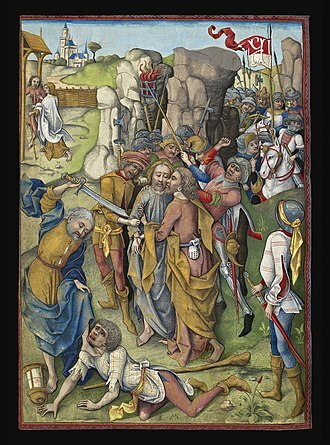 The 17 richly gilt altars were stripped of jewels and gold and smashed, as were reliquaries, vestments and altar equipment. 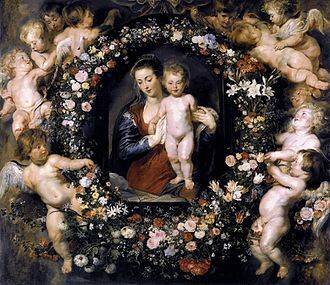 Even the name "St. Mary's" became Our Lady's Church (Vor Frue Kirke), keeping the historic reference to the Virgin Mary without the use of the un-Lutheran "Saint" appellation. Just a year later Our Lady Church celebrated the acceptance of the Lutheran order of worship presided over by Johannes Bugenhagen (1485–1558), an associate of Martin Luther. 1539 saw the installation of the first Lutheran superintendents, later bishops, of Denmark. In 1568 the dean of Our Lady Church was charged with defining accepted practice for Lutheran church services in Denmark under the direction of the Bishop of Zealand. Ever since, the dean (and later bishop) of Our Lady Church has carried out that role in the Danish National Church. Lightning strikes damaged the church in 1573 and 1585, and some of the vaulting, tower, and roof collapsed after the resulting fires. The tower was eventually demolished, but rebuilt by 1609. It had an extremely tall pyramidal central spire with four shorter spires at each corner. After the 1728 fire, the new tower rose, higher than the previous one tapering to a tall spire modeled after the spire of St. Martin in the Fields in London. The bells from the former St. Nikolai Church (Sankt Nikolaj Kirke) were moved to the new spire in 1743 and a set of four new bells were cast and added. 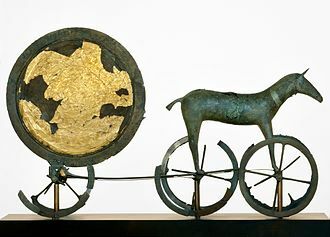 The largest bell "The King's Bell" weighed just over 6000 kg. Eventually, the tower held 42 bells. It was popular at the time to pay for extra ringing after weddings and funerals, which was a source of complaint by university students who were trying to study. A smaller tower in the same style was added to the roof line above the choir. 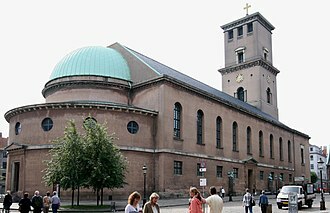 Our Lady Church was designated a Denmark's National Cathedral only in 1924. Its relatively recent cathedral status stems from the splitting of Zealand (Sjaelland) into two Lutheran dioceses in 1922. 28 October 1449 - Coronation and marriage of King Christian I of Denmark and Queen Dorothea of Brandenburg. 1536? 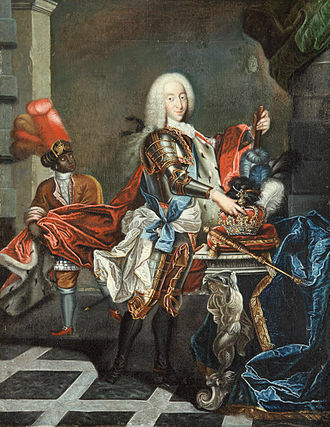 - Coronation of King Christian III of Denmark. 1559 - Coronation of King Frederick II of Denmark. 17 August 1596 - Coronation of King Christian IV of Denmark. 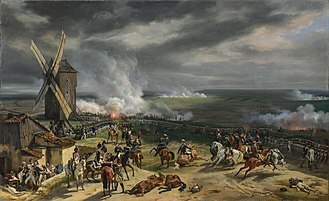 1648 - Coronation of King Frederick III of Denmark. Each morning (except Sundays), between 8.07 and 8.25 local time, Danish public radio (DR) transmits a live act of worship from the cathedral, recordings of which can also be heard via the internet. ^ "Vor Frue Kirke". 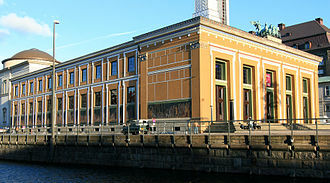 Nationalmuseet. Retrieved September 1, 2018. ^ "Hansen, Christian Frederik, 1756-1845, Arkitekt". Dansk biografisk Lexikon. Retrieved September 1, 2018. ^ "Absalon". Den Store Danske, Gyldendal. Retrieved September 1, 2018. ^ "Sunesen, Peder, o.1161-1214, Biskop". Dansk biografisk Lexikon. Retrieved September 1, 2018. ^ Susanne Torgard. 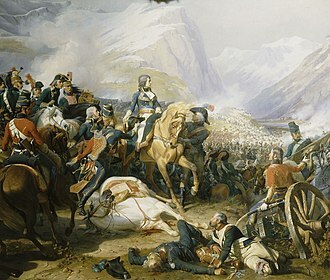 "Kirkens historie". domkirken.dk. Retrieved September 1, 2018. ^ a b c d e f "Vor Frue Kirke / Københavns Domkirke". kirkehistorie.dk. Retrieved September 1, 2018. 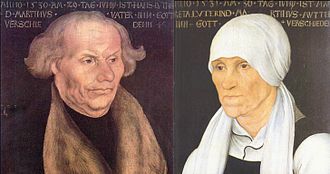 ^ "Bugenhagen, Johann (1485-1558)". Global Anabaptist Mennonite Encyclopedia Online. Retrieved September 1, 2018. ^ "Friedrich Ehbisch". Dansk Biografisk Leksikon. Retrieved September 1, 2018. ^ "Gambier, James, Baron Gambier (1756–1833)". Oxford University Press. Retrieved September 1, 2018. 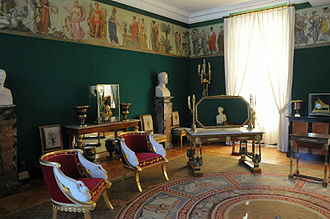 ^ "Bertel Thorvaldsen". Kunstindeks Danmark. Retrieved September 1, 2018. ^ "Vilhelm Wohlert". Den Store Danske, Gyldendal. Retrieved September 1, 2018. ^ "Antvorskov Kloster". Salmonsens konversationsleksikon. Retrieved September 1, 2018. ^ "Herman Vilhelm Bissen". Den Store Danske, Gyldendal. Retrieved September 1, 2018. ^ "Roemer, Ole Christensen". Galileo Project. Retrieved September 1, 2018. 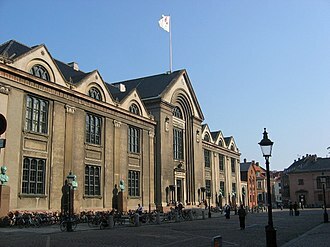 Wikimedia Commons has media related to Vor Frue Kirke (København). 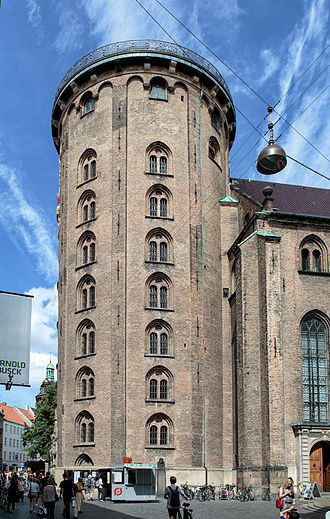 The Rundetaarn, or Rundetårn, is a 17th-century tower located in central Copenhagen, Denmark. One of the architectural projects of Christian IV, it was built as an astronomical observatory. It is most noted for its equestrian staircase, a 7. 5-turn helical corridor leading to the top, today the Round Tower serves as an observation tower for expansive views of Copenhagen, a public astronomical observatory and a historical monument. 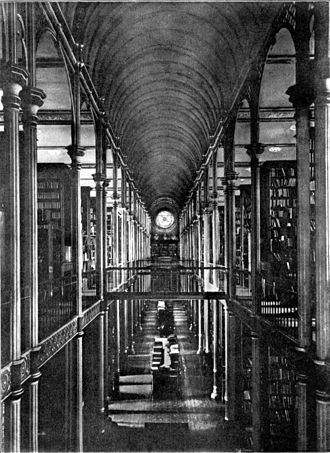 In the same time the Library Hall, located above the church, astronomy had grown in importance in 17th-century Europe. 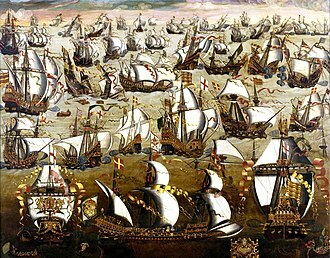 Countries had begun competing with other in establishing colonies, creating a need for accurate navigation across the oceans. Many national observatories were established, the first in 1632 at Leiden in the Dutch Republic. Only five years the Round Tower Observatory, first referred to as STELLÆBURGI REGII HAUNIENSIS, after Tycho Brahe had fallen out of favour and left Denmark, Christian Longomontanus had become Christian IVs new astronomer and the first professor of astronomy at the University of Copenhagen. In 1625 he suggested the king build a tower as a replacement for Brahes Stjerneborg which had been demolished after his death in 1601. Longomontanus initial proposal was to erect the new observatory on the top of the hill Solbjerget, but since there were plans for the construction of a new students church and a library for the university, the idea of merging the three buildings into one grand complex emerged. Already in 1622, Christian IV had bought the land where it was decided to build the Trinitatis Complex. His original plans for the site are not known but as it was located next to the Regensen dormitories. From 24 November 1636, stones were brought to the site for the foundation, first from the citys ramparts, bricks were ordered from the Netherlands since local manufacturers could not meet the high quality standards requested. In February 1637, a contract was signed with a Henrik van Dingklage in Emden for the supply of bricks for the construction, the first three ship loads were to be delivered in May, the next three loads the following month and the remainder on demand. St Martin-in-the-Fields is an English Anglican church at the north-east corner of Trafalgar Square in the City of Westminster, London. 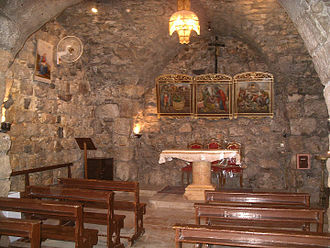 It is dedicated to Saint Martin of Tours, there has been a church on the site since the medieval period. The present building was constructed in a Neoclassical design by James Gibbs in 1722–1726, excavations at the site in 2006 led to the discovery of a grave from about 410 AD. The site is outside the city limits of Roman London but is particularly interesting for being so far outside, the burial is thought by some to mark a Christian centre of that time. The earliest extant reference to the church is from 1222, with a dispute between the Abbot of Westminster and the Bishop of London as to who had control over it. The Archbishop of Canterbury decided in favour of Westminster, and the monks of Westminster Abbey began to use it, Henry VIII rebuilt the church in 1542 to keep plague victims in the area from having to pass through his Palace of Whitehall. 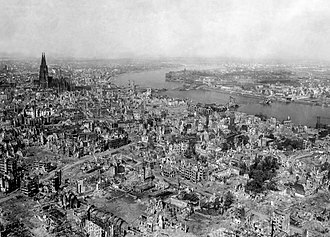 At this time, it was literally in the fields, a position between the cities of Westminster and London. By the beginning of the reign of James I, the church had become inadequate for the size of its congregation, at the same time the church was, in the phrase of the time, thoroughly repaired and beautified. 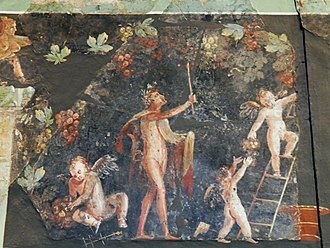 Later in the 17th century capacity was increased with the addition of galleries. The creation of the new parishes of St Anne, and St James, Piccadilly, as it stood at the beginning of the 18th century, the church was built of brick, rendered over, with stone facings. The roof was tiled, and there was a stone tower, the ceiling was slightly arched, supported with what Edward Hatton described as Pillars of the Tuscan and Modern Gothick orders. 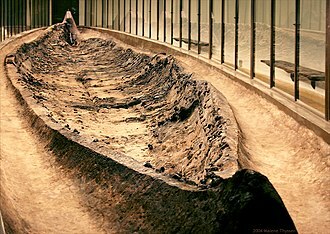 The interior was wainscotted in oak to a height of 6 ft, while the galleries, on the north, the church was about 84 ft long and 62 ft wide. The tower was about 90 ft high, a number of notables were buried in this phase of the church, including Robert Boyle, Nell Gwynne, John Parkinson and Sir John Birkenhead. A survey of 1710 found that the walls and roof were in a state of decay, in 1720, Parliament passed an act for the rebuilding of the church allowing for a sum of up to £22,000, to be raised by a rate on the parishioners. Christus is a 19th-century Carrara marble statue of the resurrected Jesus by Bertel Thorvaldsen. Since its completion in 1838, the statue has been located in the Church of Our Lady in Copenhagen, Denmark. In the 20th century and replicas of the statue were adopted by the leaders of The Church of Jesus Christ of Latter-day Saints to emphasize the centrality of Jesus Christ in church teachings. Thorvaldsen was commissioned to sculpt statues of Jesus and the apostles for the Church of Our Lady in Copenhagen, the statue of Jesus was completed in 1821. The Christus was not well known outside of Denmark until 1896, the statue is 3.2 metres high. The inscription at the base of the sculpture reads Kommer til mig with a reference to the Bible verse, in the 1950s, LDS Church leader Stephen L Richards purchased a 3. 4-metre replica of the Christus and presented it to Church President David O. McKay. In 1966, the statue was placed in the churchs Temple Square in Salt Lake City, the churchs second Christus replica was created to be displayed in the churchs pavilion at the 1964 New York Worlds Fair. The Divine Service is a title given to the Eucharistic liturgy as used in the various Lutheran churches. 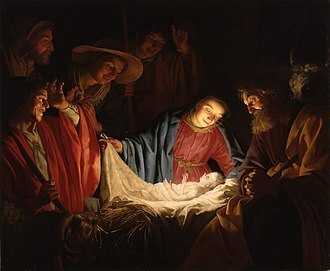 It has its roots in the pre-Tridentine Mass as revised by Martin Luther in his Formula missae of 1523 and it was further developed through the Kirchenordnungen of the sixteenth and seventeenth centuries that followed in Luthers tradition. 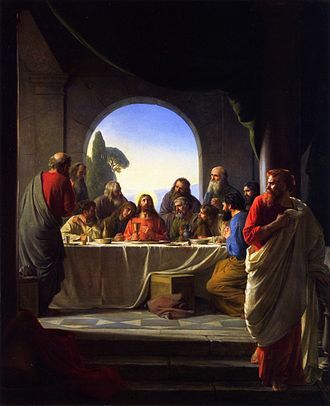 The term Divine Service is popularly used among the more conservative Lutheran churches and organizations of the United States, in the more progressive denominations, such as The Evangelical Lutheran Church in America, the terms Holy Communion or the Eucharist are much more commonly used. In the parts of North American Lutheranism that use it, the term Divine Service supplants more usual English-speaking Lutheran names for the Mass, the term is a calque of the German word Gottesdienst, the standard German word for worship. As in the English phrase service of God, the genitive in Gottesdienst is arguably ambiguous and it can be read as an objective genitive or a subjective genitive. 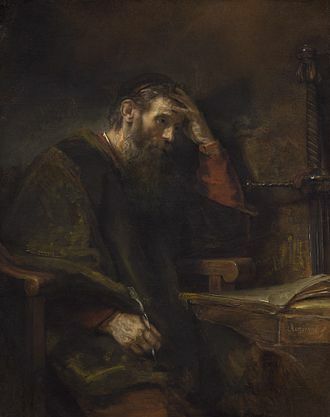 While the objective genitive is etymologically more plausible, Lutheran writers frequently highlight the ambiguity, the Lutheran liturgy currently used in the United States traces its development back to the work of Beale M. Schmucker, George Wenner and Edward Horn. Their work took place in the context of a wider North American confessional revival, between 1876 and 1883, various Lutheran synods expressed an interest in creating a common worship service. This led to the creation of a Joint Committee in 1884 which included representatives of the General Synod and General Council and this committee appointed Schmucker and Horn who began their work in April 1884. In 1887, the three men presented their final draft to the Joint Committee and this final draft used the King James Version language and Anglican translations of the Kyrie, Creeds, Lord’s Prayer, and Collects. It included the Nunc Dimittis as an option, during this hymn, the pastor and those assisting him process into the sanctuary from the narthex. The Invocation begins the Divine Service, for the Invocation and the Preparatory Service, the pastor is to stand at the foot of the altar steps, advancing to the altar at the Introit. He speaks the Trinitarian formula, as the Sign of the Cross is made by all, the Confession follows In the Confession, we kneel humbly before our God, acknowledging our sin and seeking purification of our Spirit. In the Declaration of Grace that follows, we receive from God Himself the assurance of Gods mercy and grace that enables us to focus on our loving God. Both the congregation and the pastor kneel as the following is said, Pastor, If we say we have no sin, we ourselves. 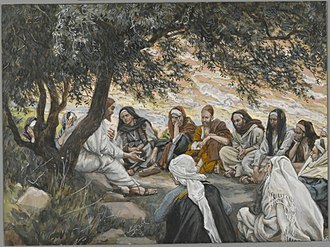 Congregation, But if we confess our sins, God who is faithful and just will forgive our sins, Let us confess our sins to God our Father. All, Most merciful God, we confess that we are by nature sinful and we have sinned against you in thought and deed, by what we have done and by what we have left undone. We have not loved You with our whole heart, we have not loved our neighbors as ourselves and we justly deserve Your present and eternal punishment. 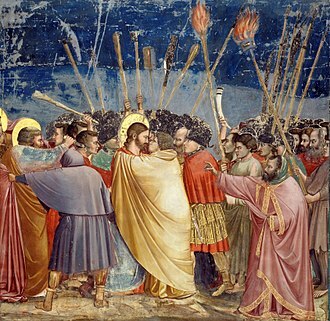 The Kiss of Judas Iscariot, coloured engraving, 15th century.